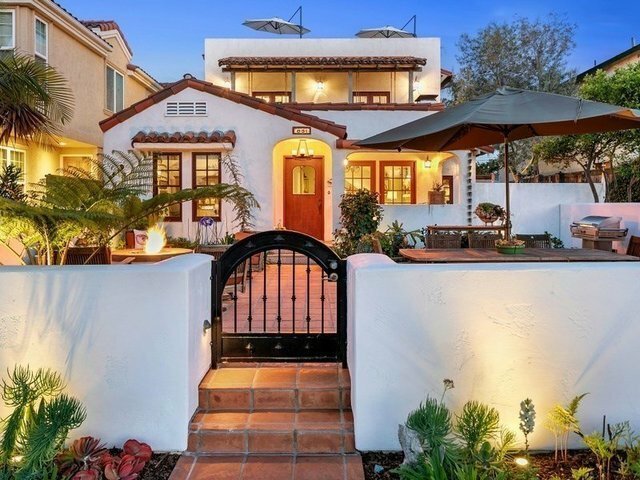 Live close to the beach in this Charming Spanish Coronado Beach House. Enjoy modern amenities including a newly remodeled gourmet kitchen with large island, Cambria countertop, French banquette style dining area, heated floors, surround sound. Lots of outdoor spaces. Rooftop deck w/panoramic views of Pt. Loma & Downtown. Fabulous saltillo garden courtyard with fire-pit & BBQ. 2 terraces, backyard & side yard. Entry level Master suite & upstairs Master Retreat w/bonus room & terrace. See Supp.